GRAYSLAKE, Ill. (WLS) -- A woman killed in a four-vehicle crash in north suburban Grayslake was identified. Heidi Bauer, 43, of the 200-block of Wellington Circle in Gurnee, died after the car she was driving was struck on IL-120 near Battershall Road Monday afternoon. The Lake County Sheriff's office said a landscape truck traveling east on IL-120 crossed the center line around 1 p.m. and sideswiped a dump truck heading west. The dump truck hit a 2003 Honda Civic and a Ford van. Bauer was driving the Honda. 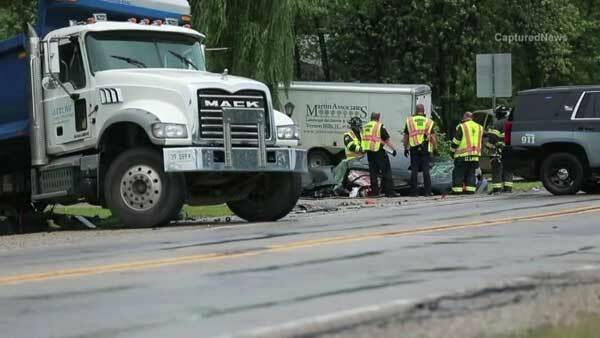 The driver of the landscape truck and the man driving the dump truck were both taken to Advocate Condell Medical Center in Libertyville in unknown condition. A passenger in the landscape truck and the van's driver were treated at the scene and released. No citations were issued. Any charged related to the crash will be filed once police conclude their investigation.